COLUMBIA, 1/18/17 (Feature) -- Columbia homeowner Josie Sullivan has been trying to get City Hall's attention about a longstanding problem: inadequate storm water drainage. Sullivan lives in the First Ward’s central city, where storm water problems impede affordable housing and economic equity, goals the city manager and City Council have been touting. The excess moisture plays havoc with the area's mostly 90+ year-old wooden housing stock, shifting Missouri’s famously fickle soil to open cracks in plaster walls, while breeding termites, wood rot, and mold. "Josie Sullivan is fed up," KMIZ reporter Alyssa Toomey explained. Sullivan has been asking city officials to install a storm drain for nine of the eleven years she has lived on West Ash St. First Ward Councilman Clyde Ruffin hasn't returned her calls, and Sullivan faces $11,000 in stormwater-related repair costs. Ruffin finally responded to Sullivan when she addressed the City Council earlier this month. "The city is really conscientious about dealing with these problems, but they are problems that just can't be remedied overnight or immediately," Ruffin told ABC 17 News. "Hers is unique, in terms of eleven years of coming back and forth, trying to get some solution." "This has been nine years," she told the Council. "Please, please help me." 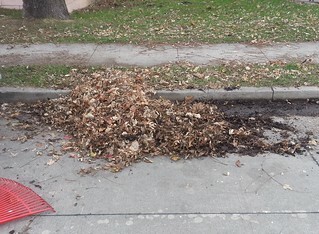 Not only do central city streets like Ash lack adequate storm drainage, lack of street sweeping clogs existing storm drains, with leaves, sticks, mud, and debris. 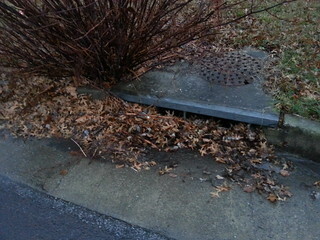 Clogged drains and gutters back up all along a street. "Dump and pumps" aggravate the problem: Periodicals wrapped in plastic, dumped in rental-heavy neighborhoods (where residents are less likely to complain) to pump up circulation figures. 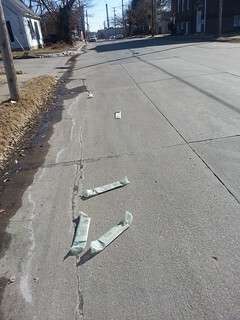 Newspapers, phonebooks, advertisers, and other brick-and-mortar spam wind up in streets, clogging gutters and drains. By contrast, the 4th Ward's Old Southwest -- next door to Sullivan's neighborhood, just south of Broadway -- is often treated to teams of street sweepers. Free papers don't litter the streets, and storm drain/sewer projects completed in the last decade have greatly alleviated basement backups. But homeownership dominates in the Old Southwest, which also has an entirely different social and cultural history. Lack of city services most neighborhoods take for granted is typical of life in Ward One central Columbia, roughly bounded by West Blvd, Broadway, College Ave., and the Business Loop. Sidewalks are a visible example. Most streets south of Broadway have them on one or both sides of the street. From Broadway to Ash, sidewalks line at least one side of the street. From Ash to Worley (down Alexander, say), there are often no sidewalks, and few storm drains. This pattern of infrastructure inequity repeats with crosswalks, street lights, street signs, curbs, gutters, even asphalt quality. Central city streets that do have newer infrastructure (e.g. new storm drains) were often forced to wait decades for Federal CDBG funds (aka "block grants") to pay for the upgrades, a practice some call "city government making poverty pay." Central Columbia is dotted with Shotgun Houses built between 1910-1920, most unrecognizable now, as generations of owners have added porches, extra rooms, and garages. A typically African-American architecture, the Shotgun Houses harken back to segregation and Jim Crow, when city leaders deliberately withheld basic services from predominately black neighborhoods. The deprivation was particularly acute in Columbia, the seat of a central Missouri area known as "Little Dixie" for its strong ties to slavery and the Confederate South. In the late 1950s and again in the mid 1960s, the Columbia City Council used its own negligence -- poor sewers, mud sidewalks, and dirt streets -- to declare 168 acres of black-owned central city homes and businesses "blighted". Council members condemned the neighborhoods and sold the land for pennies on the dollar, to Columbia Public Schools, the Columbia Housing Authority, and prominent white businessmen. Despite the city's push for "social and economic equity," this history has an ominous overhang. Though Columbia considers itself a college town enlightened about racial, social, and economic justice, it remains, in policy matters, the heart of Little Dixie, and still has a long, long way to go.